Winkie’s supporters are probably aware of recent reports of a dog mauling a number of antique teddy bears at a museum in the U.K.—including a bear that had once belonged to Elvis Presley. We are particularly saddened that, according to a complaint filed this morning by Winkie’s lawyer, prison guards have repeatedly taunted our own bear with this news. Please tell Winkie that I support him! He looks like such a sweet, cuddlable bear. We were about to say Winkie surely appreciates thoughts of cuddling but Yepoka points out that we can't possibly know that, and moreover it's wrong to project our feelings onto other cultures (in this case the culture of toys). Yepoka is right, I shouldn't assume that Winkie wants to cuddle just because he's a toy. I would never cuddle Winkie without his consent. Is Winkie allowed to receive presents? I could crochet him a nice blanket if he's allowed to receive it. Poor Winkie. Are there any particular colors that Winkie likes? Winkie has reportedly refused to speak to anyone, not even his attorney, so we don't yet know his favorite anything--though presumably he enjoys the colors of leaves and berries. I'll make him a beautiful little poncho the color of leaves and berries and sunsets. And if you ever need help, Free Winkie Committee, let me know. Thanks for the offer. We need help getting out of jail. Can you post bail? Or if you could send cigarettes--we hope to use them to procure toothpaste. How much is bail? I don't have a lot of money but I'm holding a bail drive for the Free Winkie Committee. I included cigarettes in the drive but would it be easier to just send you toothpaste? Are you allowed to receive toothpaste? bail is set at $900,000 each, or $2.7 million. a check is fine. thanks. oops, no, 7 times 900,000 is 4.9 million! wow, that's a lot. and the other inmates are no help with the math. thanks again for your help. Anytime. I don't have $4.9 million, so I'm holding a fund-raiser. Until then I'm sending a carton of cigarettes for you to split. Good luck! The cigarettes arrived--many thanks. We're having a little argument about whether or not to just smoke them and skip buying toothpaste--some of us are feeling rather hardboiled after six days in "stir." I belive winkie is the best book thats come around in along time.Winkie is a strong willed bear as I think everyone should be. did Winkie abandon his myspace? I understand that using a keyboard may be difficult, or maybe the internet cafes in Egypt are hard to come by. Anyone know? yes, winkie has been told it's inadvisable to visit his my space while he's on the lamb. he had found typing difficult anyway. My writing teacher hated stories about inanimate objects from his students, especially TEDDY BEARS. Of course, Winkie is not inanimate. This same teacher also knew there were exceptions to the rules. My story told in the first person by a narrating brassiere was a big hit. I think Winkie is a worthy successor. Winkie applauds all forms of self-expression. It must not have been easy for Winkie to experience what he did, I admire his determination. And my stuffed bear, Cubbykins, vouches for Winkie's character and the contribution he has made for stuffed animals worldwide. Oh, and Cubbykins and I would also like to tell Winkie to not lose hope, he has friends who believe in him and support him. Cubbykins thanks Winkie whole-heartedly and he also hopes to one day meet Winkie, incarcerated or not. I'm sure they would get along quite well with each other. Has Winkie ever met another stuffed animal, by the way? If he didn't then that would mean that Cubbykins would be the first!!!! 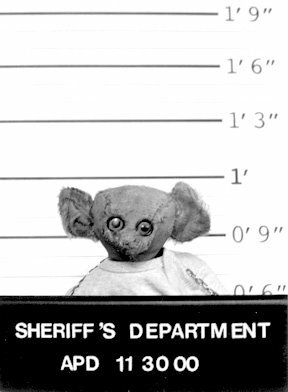 Winkie has met many stuffed animals over the years, especially during his travels since his escape from America. But he has never met a Cubbykins before. It's just that Winkie's been through so much turmoil over his life, he could really use a friend he can relate to. I could mail Cubbykins to Cairo so that he and Winkie could get together. He is still in Cairo, isn't he? By the way, what does Winkie want for Christmas? Happy Thanksgiving, Winkie! I hope you're happy & full, wherever you are. Well, what DOES Winkie want for Christmas? iheartwinkie: winkie is vegetarian and refuses to recognize thanksgiving, but he appreciates your sentiment. anonymous: for xmas winkie would like a copy of steel magnolias, his favorite movie, on dvd. apologies for the delay in reply--winkie is in hiding. How about if I just send Cubbykins by air mail to spend the holidays with Winkie? we have reason to believe all mail going to winkie is opened and searched, so we fear if you try to mail cubbykins to him, cubbykins may himself end up in jail. stuffed animals in particular have to be careful right now. Merry Christmas Winkie! We hope someday that your life will become brighter for you.